OUR PRICE: $27.54 - Join Rewards Get $2 Dance Dollars On This Item! 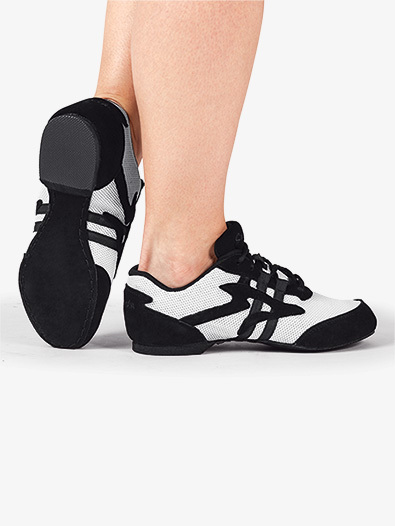 This is the perfect shoe for yoga, gym, ballroom practice, and dancing. It is light and comfortable with a padded insole, suede sole with arch support and rubber heel. I got these shoes to intermix with my other practice ballroom shoes when I didn't feel like wearing any type of heel. I would have given them 3 stars, but I gave them a 4 because of the price (which is hard to beat). I wear an 8-8.5 normally depending on the brand, type of shoe, etc. Following the Sansha Sizing chart I ordered a 9, which fit snug, though if you like your shoes looser, I would go with the 10. I needed more arch support so I got some dr scholls inserts for that, and they are now quite comfortable. The heel backing is a little low for my tastes, and at first I thought my foot might slip out, but it works and it's easy to point the foot. The suede sole on the front half works the same as in normal ballroom shoes, making spinning and dancing much easier than if one tried it in street shoes. The rubber heel (feels like a hard foam) made heel leads a bit different, but it was easy to get use too. They've lasted a couple hundred hours of dancing for the last several months and are still in good condition so far. Definitely not for rough floors or outdoors though, that would destroy them. Overall I would say they are worth the base price, and I do not regret my purchase. I wear street shoe size 7 and heels size 6.5 I ordered size 8 as suggested in size chart and fit perfect. Bought for Zumba class but bottoms are pretty slippery and don't provide enough ankle support for me. I have had these for a year now for hip hop class. As a female, I ordered my street size, and they fit perfectly, but I am an adult, so my feet aren't growing and I like tight shoes! I'm going to be ordering these for my son for break dancing. He's in size 5 women's, 3 boys, so I will probably go with the 6 so he has room to grow. 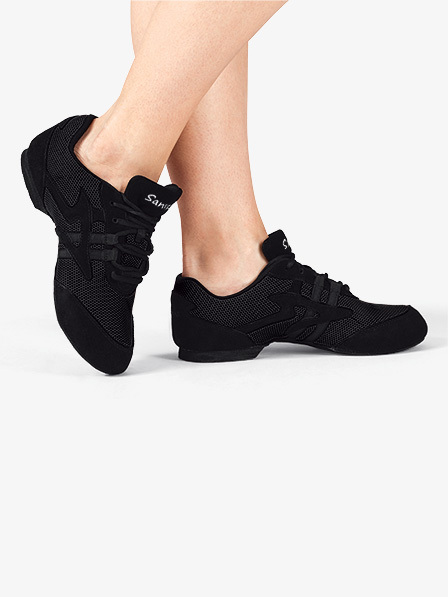 I had originally ordered Capezio dance sneakers for my dance team performances at college, but the heel was simply too high and I ended up spraining my ankle by wearing them. I found these and hope they will work much better than those. I like the low heel and the slimmer shape to them. Will post a new review once they have come. Just rec'd these. They are required for my daughter. Season starts next month. I can only rate how the shoe fits as it's not being used yet. My daughter is a 2 in street shoe. I ordered her a 5 and it's do-able but she would have been better off in a 4 (not paying to return them!). I was also unaware (nothing in the description states this) that they are for "indoor use only". The dance coach always has them in dance gym shoes for field and outdoor practice until the weather gets too cold. She wants to stick with these this year. We'll see how they hold up. These shoes are really "fat". They are cute off, but when you put them on, they make your feet look really wide. They are comfy, but I returned them, because of the way they made my feet look. This shoes are so comfortable that I can dance much longer than I can in any other shoe. It protects my feet from trauma. My normal shoe size is 6.5 - 7. I ordered size 8 which was according to the size chart. When they arrived I could tell just looking at them that they were HUGE! All these reviews that they run small is very strange. My feet were swimming in them and they were very wide. Returning them to exchange for a smaller size. Other than that, they are fantastic! I wear a 9 and I ordered a 11 and my toe was touching the end. I'm returning them and ordering a 13 . I like the shoe and like the way it slides on the floor. Like the various colors. MY GYM I GO TO HAS WALL TO WALL RUG AND WE ZUMBA DANCE AND EXCERCISE . THESE SNEAKER SHOES ARE THE BEST FOR GLIDING ON THE RUG AND COMFORTABLE ,BUT RUN VERY SMALL. I TAKE A 7, BUT ORDERED A 9 ,,, FIT PERFECT. CHECK THEIR CHART FOR THEIR SIZE. Very comfy, cushy around the ankles, front sole is just suede, so don't wear them outside. Does not have support in the toe. Great shoe, wonderful price. My country line dance class definitely noticed. I kept seeing eyes move toward my feet because there was such a difference in my dancing. These shoes make a difference. I now have several colors in this shoe. I teach dance and I use it for Ballroom, Swing, Latin, Country, Hustle, Line, and Zumba. I have ordered many colors for all of my students. These shoes do run 1.5 to 2 sizes small. The suede sole is great but I do agree that it wears out quickly. You can resole these yourself. I bought the suede material and glue (DC2000) at local crafts store, made a paper pattern to use for cutting the shape and glued it on. Place a heavy book on it for overnight drying and ready to go again. I bought this shoe for salsa dancing. I followed the table to figure out what size to get. I wear an 8.5 wide shoe and ordered the size 14 . It fits great, is very comfortable and moves smoothly on the floor. I am very happy. I love the style of this shoe but it runs quite small. I ordered a size larger than my regular shoe size and it was still too small. Love this shoe because of its suede sole which allows quick easy turns. Also has good support and very comfy. My only complaint is that it runs small. I usually wear a sz 11 or 12 and can just fit into a 16! I have large/wide feet and I have a hard time finding a shoe that fits. These come in wide and larger sizes! So even one of the guys on the dance team was able to find them in his size. And it has a nice wide round toe area that won't hurt. With the suede sole, you have a good glide without the torgue on your knees while doing turns and pivots. I use them for Ballroom, Swing, Country Western, Latin. One of my friends wear them while teaching Line Dances. And they come in different colors. Love my purple ones. I bought these to teach Zumba in. I teach on carpeting so it is definitely not an ideal situation. The suede bottom is perfect for movement and does not catch on the carpet. 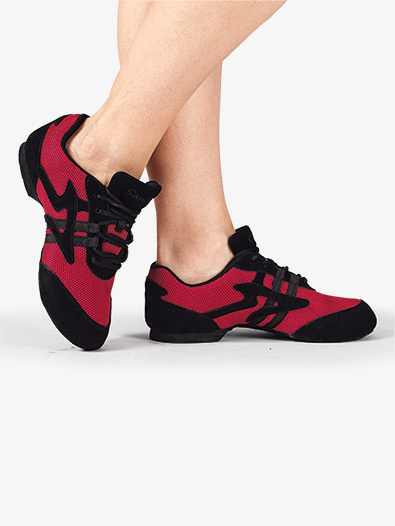 I haven't tried them out at the dance studio yet but I like the quality of the suede and do not foresee a problem. If you have a narrow foot like mine, the front part of the shoe may be a little big. Overall, it was a great fit and I like the thinner bottom and arch support. (*Note: I am also a ballroom instructor/ballet instructor so I prefer the thinner bottom as it is closer to what I am used to dancing in but needed the arch support of a dance sneaker. If you are used to the thicker bottom like many hip hop/fitness/Zumba shoes the thinner bottom may not feel supportive enough for you). Although many M.E. dancers go barefoot in class, I need a shoe for my sensitive feet. I had a hard time finding something with a nice smooth sole without a bunch of pleats right under the ball of my foot. These shoes are perfect! The suede sole is smooth and flat, not grippy, so I can turn easily without knee stress. The slight heel helps ward off my plantar fasciitis problems. Because they lace up I can adjust their tightness easily. The one caveat is that they do wear out more quickly than the leather jazz shoes I have owned... but that's okay. I just keep a backup pair on hand. Can these be worn outside at all or on a track? These shoes have a suede sole, so I would not recommend wearing them outside or on any rough surface. My husband needs a size 16 which is currently out of stock in black. When will you get more? Unfortunately, we do not have an exact date of expectation for this size. However, backorders are normally restocked within 2-4 weeks. is this shoe a split sole or flat sole? The description for this shoe states that it is a full sole. The description of the shoe states it is a full sole. How much padding/cushioning is there underneath the front part of the foot? The description says it has a padded insole. I'm wondering if it is thin or thick. I'm hoping it's a little more like a tennis shoe. The padded insole will be thin. I needed to order two sizes up for the shoe to fit comfortably. I also wear these sizes in dance or street shoes. I order a size 7 in this shoe. does this sneaker have two colors? I need it in white, and just white. On the pictures provided it show the sneaker with two colors, one being black. It does not come in white. Does this sneaker have a spin spot? There is no mention of a spin spot in the product information. This shoe has a suede sole and NO spin spot. If you are looking for a sneaker with a spin spot, you may want to take a look at the following styles: T07L,S0524,DN520L to name a few.